"a picture of my daughter, once a week, every week in 2014"
This kid likes to pull faces, let me tell you. 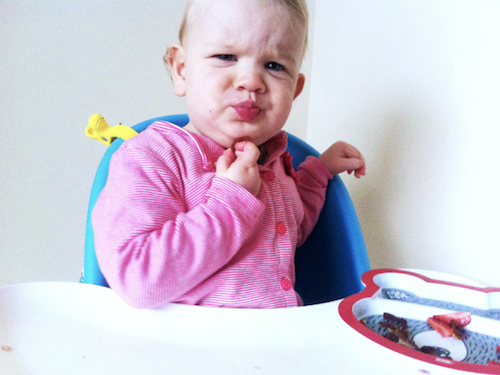 This week Romy started to really refine her 'cranky' face with one raised eyebrow and all. It's the face she pulls at me when I go into her room first thing in the morning, and it is almost as good as a big cheesy smile. She knows we find her 'cranky' face funny and a sly grin usually comes straight after. Her cheeky personality is definitely shining through more and more each day. When I was a kid I always made funny faces at the camera too! haha!